The mother, Abhilasha Arup Das Adhikari, took to Facebook to express her experience, stating she was asked "not to do home chores" in the shopping centre. A mall in Kolkata faced backlash on social media after it barred a woman from breastfeeding her seven-month-old baby on November 27. 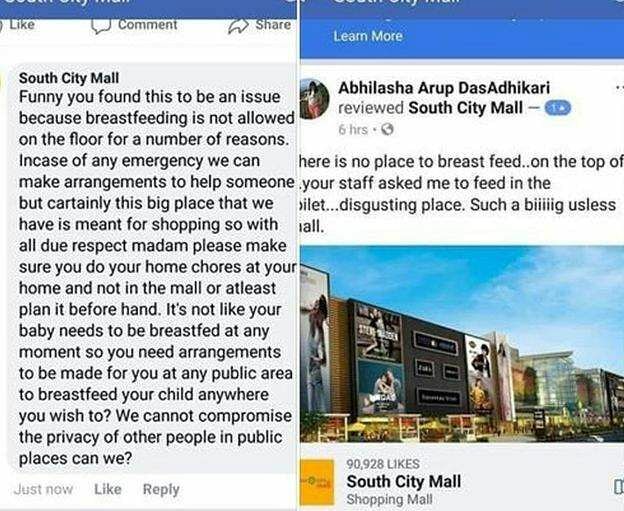 She wrote on the Facebook page of the South City Mall that there was "no place to breastfeed" and that the "staff at the mall had suggested that she feed her baby in the toilet". She described the idea as "disgusting" and gave the mall a poor rating. However, it is the response of the shopping centre that has irked netizens across India. Replying to her allegations, the centre replied, "funny you found this to be an issue". The mall later issued an apology claiming to have a feeding and changing room for babies on every floor. The Vice President of the mall, Manmohan Bagri said that the response to Das Adhikari was posted by an employee of a social media agency that managed their Facebook page. "The rude and aggressive reply was posted without our consent. We have removed the agency," said to TOI.